Hello The Pinning Mama fans, it’s Jen from PinkWhen.com. Today I am going to share with you one of my new all time favorite recipes. 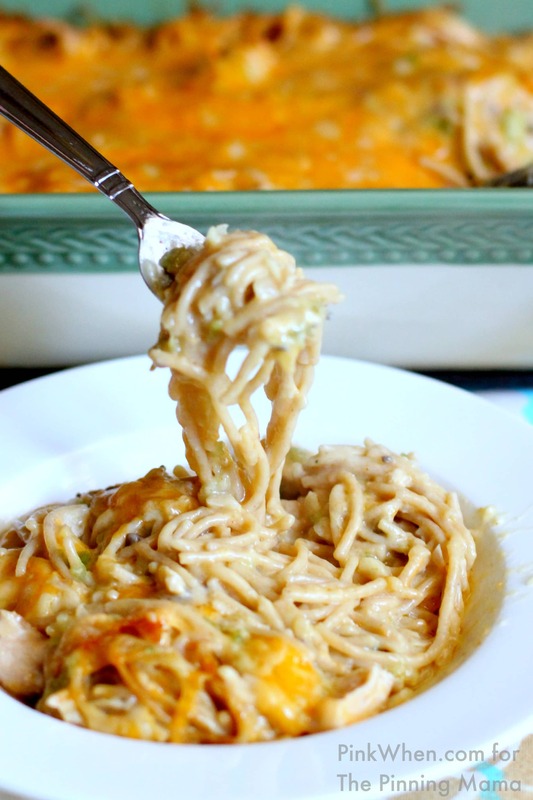 It’s a delicious Cheesy Chicken Spaghetti. 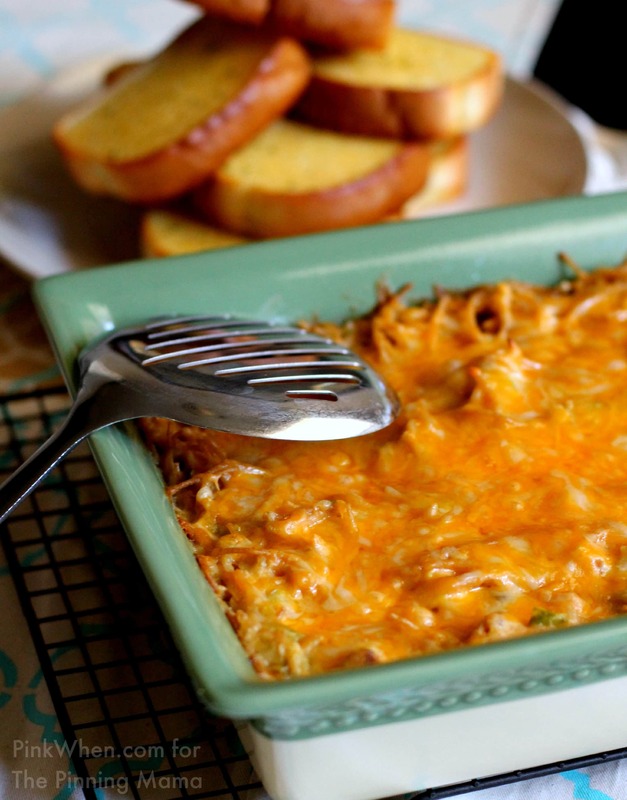 I have to admit that I have had a few Chicken Spaghetti recipes before, but never one as cheesy and delicious as this one. Hold on to your hats, because this is literally going to knock your flavor socks off! You have never had Chicken Spaghetti like this! 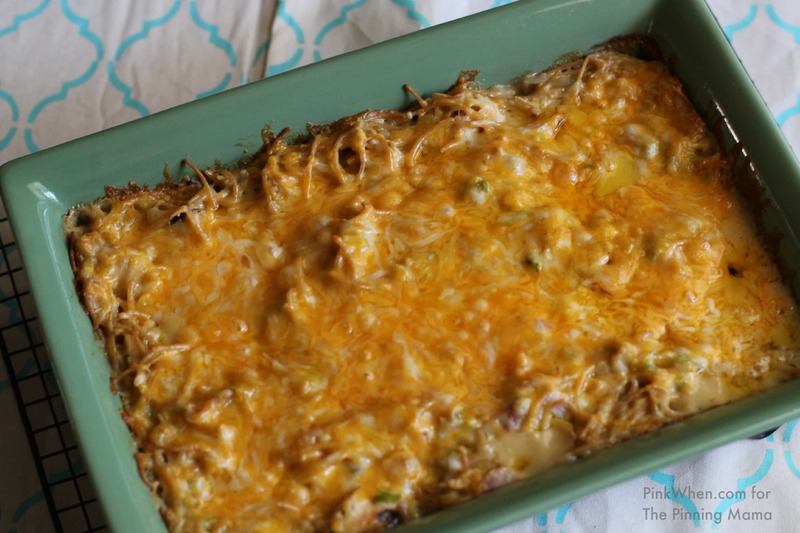 Easy cheesy chicken spaghetti recipe- the best! Heat oven to 350 and prepare a 9 x 13″ casserole dish. If you haven’t already, boil and then cube your chicken breasts. Set aside. In a large pot of boiling water, add the spaghetti noodles and cook until al dente, careful to not overcook. Drain. In a large mixing bowl, combine noodles, chicken, 2 cups of cheese, softened butter, soups, cayenne, salt, pepper, onion, bell pepper and mix well. Pour mixture into 9 x 13″ dish and then bake uncovered for for 30 minutes. Remove from oven and top with remaining 1/2 cup of shredded cheese and bake for an additional 10-15 minutes until cheese is melted and bubbly. This is literally one of the most delicious, and surprisingly easiest recipes ever. (**As a side note, when making this recipe, you could also substitute the 3 chicken breasts with some Rotisserie Chicken meat from your local grocers deli and save even more time.) It’s AMAZING. 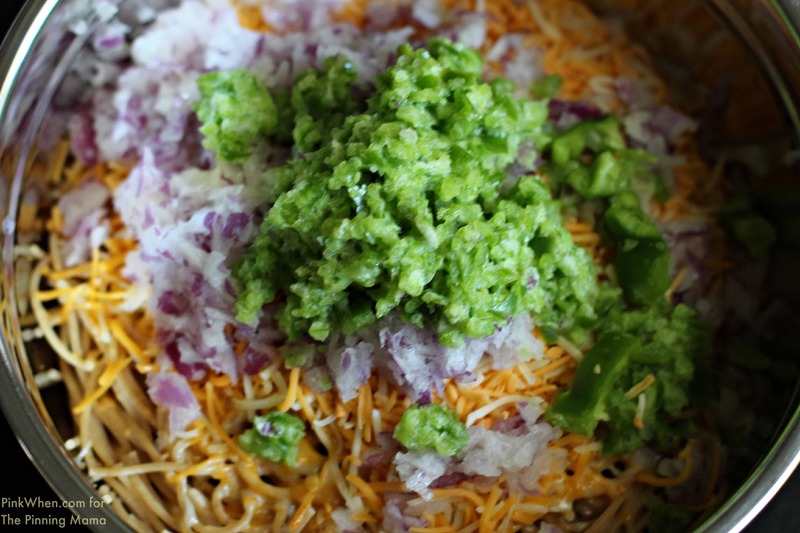 I hope you enjoyed this delicious Cheesy Chicken Spaghetti recipe today. 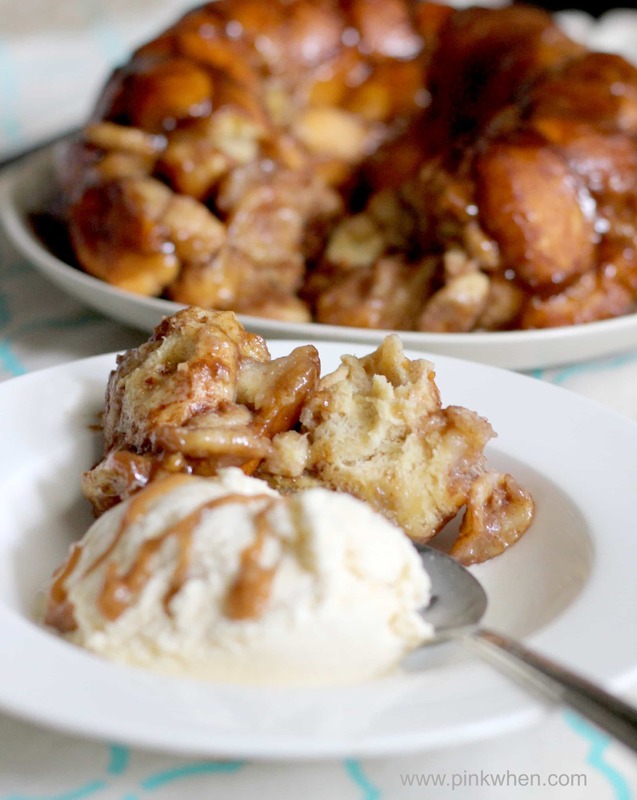 If you are looking for a few other yummy recipes, you could always try this delicious Banana’s Foster Pull Apart Monkey bread. 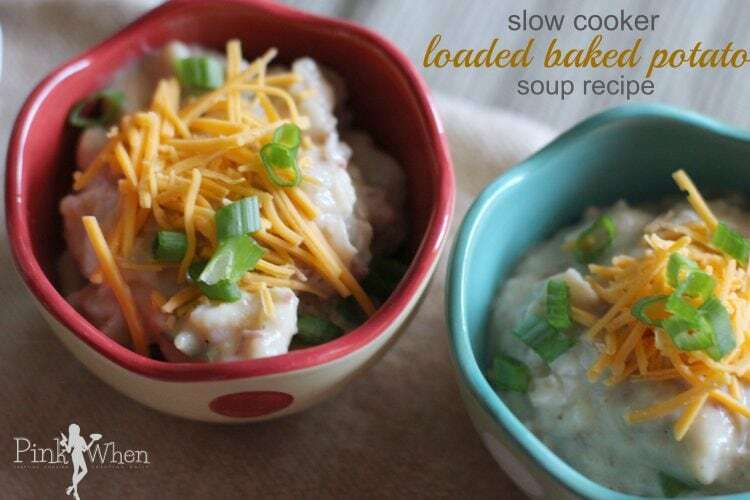 Or, if you are looking for a delicious Potato Soup, try this Slow Cooker Loaded Baked Potato Soup Recipe. Make sure to stop by and say HI! You can find me on Facebook, Instagram, and Pinterest daily! Yes Kimber, that surface of gooey, melted cheese is definitely calling my name. Who doesn’t want to dig into that on a cold day (which we are having, by the way). I’ll pin it to try next time I have a crowd! Doesn’t it look amazing! Jens recipes are always great! I made this a few weeks ago and want more after looking at this again! This looks delicious – I know my boys would love it! Thanks for the recipe. You are so welcome! This has got to be comfort food at its finest! Wow this looks delish! It’s sorta like king ranch chicken but with pasta instead of tortillas. I’m going to give this a try!